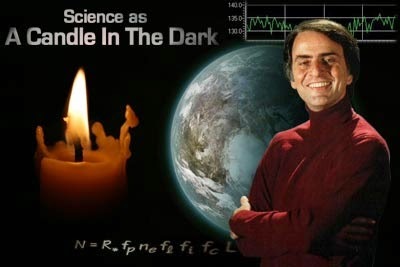 For my book report I chose to read The Demon-Haunted World: Science as a Candle in the Dark by Carl Sagan. While looking at the list of books, this book stuck out the most interesting to me. I liked how it talked about the science and also the pseudoscience involved in different aspects. For example, aliens, demons, witchcraft, and magic; all things that I find very interesting. So because of this, this book definitely stuck out the most to my interests. I started reading the book and couldn’t put it down. The book has a collection of twenty-five essays, which several of them are written with Carl Sagan’s wife. The essays range. For example, humorous accounts of a variety of pseudoscientific endeavors to serious attempts to understand the nature of alien abduction delusions. Carl Sagan I believe wants his reader to ask questions about what they are reading. And also to get you to be a little skeptical about what you hear on the news or what you read on the Internet or in newspapers. His book definitely made me ask questions and had me thinking. I found it fascinating. The reason I liked this book was because it was different from any other book I have ever read. I enjoyed how it was a bunch of different essays, so it kept the book interesting because you didn’t get bored of it after the first chapter of reading. For someone like me that doesn’t necessary like to read, this book was perfect for myself because of how it was broken up. While I was reading the book there was a quote that I found interesting. It was on page 43 and it said, “pseudosciences…pseudoscientific doctrines…that alien beings from distant worlds visit the Earth with casual impunity.” Carl Sagan did not find it rational to believe that aliens were visiting us with what he called “casual impunity.” I just thought this was interesting because I do in fact believe that there is another life out there, I just don’t know exactly what it is. This book relates to our class. I found it to relate to chapter one because chapter one talks about pseudoscience and this book explains methods that help differentiate between what is pseudoscience and what is science. But also, I found this book to relate to a decent amount of what we discussed in the power points and also what we read in our class book. Overall, I found this book to be an interesting and unusual read. It was definitely a book that I was not used to reading, but it expanded my horizons. I would encourage people to read this book, especially those that have a love for science. Also I decided to do a little research to see if I could find out why Carl Sagan decided to write this book. I found different parts to his last interview. Below is a link to part 1 which he discussed pseudo-science, religion, and his love affair with science. I’m glad I took this class and got to read something that I wouldn’t have normally picked up on the bookshelf.